I am Silvia, the mother of Nina. Nina is 8 months now and I’m still overwhelmed by her presence in our lives! I cannot remember well how life was without her. Nina is our first daughter. My husband and I kept our relationship between 2 countries for quite some time. I’m Brazilian and he is German. Since we were both freelancers, it was not difficult to organize our schedules to spend time together in 2 different continents. I came to Germany for the New Year’s Eve in 2007 and we came back together to spend the summer in Brazil. I stop taking my pills after I made a mess with the jetlag, and told Thomas (who always wanted a child) I would start again next month, if I got pregnant, it would be ok, but I did not believe it would happen. 5 weeks later I had my first ultrasound! It was one of the biggest moments of my life, everybody knows how strong it is to hear your baby’s heartbeat, but when it happens it’s impossible to describe how great it is. We decided to get married and have the baby in Brazil, but we figured it would be better to move to Germany so I could take care of the baby and my husband could keep working. My pregnancy was wonderful. No problems, just fun. I was alone most of the time while Thomas worked in Switzerland and China. He arrived a few weeks before she was born and we got married when all the papers were done. I was already 39 weeks and no sign that Nina wanted to come to us! The exams were all ok. When I completed 40 weeks we repeated the doppler and something was wrong. When the doctor at the lab asked “Who is your doctor?” my heart almost stopped beating. He explained to us that my baby sent an “alert sign”, she was sending more blood than usual to her head and it meant she was saving oxigen. He thought we should not wait anymore. That night was awfull… I was terribly scared. Next day in the morning my doctor, Thomas and I agreed that I should go for a cesarian. At 9 PM Nina was born. She cried a lot and stopped as soon as they put her in my arms. Everything fine, big emotion… The apgar was great, and a few minutes later my doctor explained that they found out I have an uterus septus and Nina had her head turned to the back, probably because there was not enough space in the last weeks and that was the best position she could find. But everything was ok.Her first day was good, she was beautiful and very different from the other babies! Full of blond hair, huge chinese blue eyes. She slept all the time and I felt the happiest woman in the wolrd. My husband was in heaven. Our problems started in the second day. She wasn’t able to drink and a sequence of misunderstandings, things said in the wrong way, transformed what should be perfect into a nightmare. During the night Thomas went to the nursery to take a look at Nina and she wasn’t there. Someone told him she was at the second floor with another doctor so he went downstairs to look for her. The doctor told him she wasn’t able to drink because there was something wrong with her chin, it was too small. I don’t know wich words he used to a foreigner, but my husband was really scared when he came back. I tried to contact this doctor to understand what was going on, but he didn’t come. They sent a nurse instead, who accidentaly said “we don’t know if there’s any relation with the big eyes and the chin”. I asked “ what do you mean? ?” and she gave me some confuse answer, and I noticed she said more than she should. We couldn’t sleep the rest of the night. Nina had to spend many hours receiving light and still couldn’t drink anything. I completely lost it, Nobody could tell us exactly what was going on. In the morning I started to cry really loud in the corridor when the cheaf of the nurses came to talk to me. She quickly figured that what happened during the night was not right. We are talking about a very famous hospital in São Paulo. In a few minutes the head of the paediatricians came to talk to us. He told us Nina had a “cianosis” during the night, that they didn’t know exactly what happened, but she went “pale”. He understood that there was a miscommunication before and it shouldn’t have happened. He asked if we would agree to move Nina to the semi intensive care just to be sure everything was ok and run some tests. It would be better for her to keep the treatment for ictericia and if we wanted to, they would call a geneticist. He didn’t believe there was anything wrong with her but it would be better for us to come back home without any doubts. And everything went pretty well, the ECG was ok and the only thing the geneticist found different was some extra skin in her neck. The first month was difficult. She lost more weight in the first week at home. I couldn’t breastfeed her wich was very frustrating to me. If I only knew what was coming, I wouldn’t have felt that bad. She could easyly drink from the bottles and after seeing a speech therapist and trying many things, I had to give up and accept breastfeeding wouldn’t happen. I kept rememebering the things I heard at our pregnancy classes, how important the mother’s milk is, etc, etc. I even had to answer the question at the supermarket “she is so small, why are you buying artificial milk?”. People can be very mean and invasive! But the important thing was she started to gain weight after 2 weeks and everything seemed fine. She was such a lovely small baby. The second and third months were full of joy. Thomas’ mother and brother came to visit in Brazil, that was a wonderful time with the 2 families together. When Nina completed 3 months her paediatrician said she should support the head better at this age and advised us to see a neurologist. She always agreed that Nina had an unusual face. Again, total panic. I hated the doctor. How could she say something like that about my precious girl? And It all started again. Before we saw the neurologist I took her to another doctor, a friend of the family, and he was more optimistic. He thought her posture was wrong and it was probably related to her position in the uterus. We blamed my septus for everything, that was the reason she couldn’t drink from my breast and now this. But he also found something strange. Her fontanella was closed and it was too early for that. It could be that it was ok from the inside, but we should check it with the neurologist since the head needs space to grow. And depending on the case, surgery would be necessary. Only God knows how afraid I was. But again, it turned out everything was fine and after the CScan we were told not to worry about her. The neurologist also added that her cognitive test was great. Some phisiotherapy could help her. Ok, lets move to Germany in peace. And at Nina’s 4th month anniversary we came to Hamburg. It was very hard to say good bye to my sister, nephew and niece, my father and my best friends. It’s never an easy decision. We left a very hot summer and arrived in the end of the winter in Germany. It was so cold… But that was also good to introduce Nina to the other part of her family. We had lots of things to do, specially regarding health insurance and renting an apartment. Luckly the thing with the insurance was quick. Because after 2 weeks Nina was ill. She woke up screaming with colics and some fever. It was Sunday. We tried to give her some medicine and she felt a little better during the day, but it all started again and we took her to the hospital in the evening. I will never forget this place. It’s called Altonaer kinderkrankenhaus, a children’s hospital where our niece had been before, it was highly recommended by my brother in law. After some minutes in the ER, the doctor in charge asked if we had been to a geneticist before. Oh God, not again… She thought her ears were too low and we should run some tests in the next days while being in the hospital. Nina would probably stay for a few days, they could not ifigure out what she had in the beginning but probably some viral infection like many other babies there. Aparently that was some epidemic thing going on. And in 2 days she had not only a gastro enteritis but chest and lungs infection as well. She was so thin and weak, and so quickly. She stopped eating. We were devastated. We didn’ t see her smile for days. The doctor that took care of Nina for the next days turned out to be very important in our lives. She explained that during the ultrasound for the stomach they found out Nina’s kidneys had an unusual shape, like a horse shoe. She asked if we would agree to investigate for some genetic syndrome. Very different from other doctors we saw before, she made us feel safe and was very competent on finding the truth. Later on they told us that when the X-ray of the chest was made, they also found out her clavicula was divided in 2 parts at the right side. At that point I told my mother in law, my sister and Nina’s godmother that we should be prepared for what was coming. We might have a special child, I said. All the time my husband and I agreed that we wanted to finally have a diagnosis, no matter what. Every doctor that entered the room had something to say about Nina. Even the orthopedic doctor who thought her muscle tone was too soft. They tried to reach Dr. Meinecke but he was out of the country so we had to wait for a few days, while Nina was still recovering. On Friday morning he came. I was alone with Nina in the room. I told him to be gentle because I was very afraid of what was coming. He looked at Nina and asked “Are you prepared? Because I know what your daughter has.” I said yes, is there a name for that? 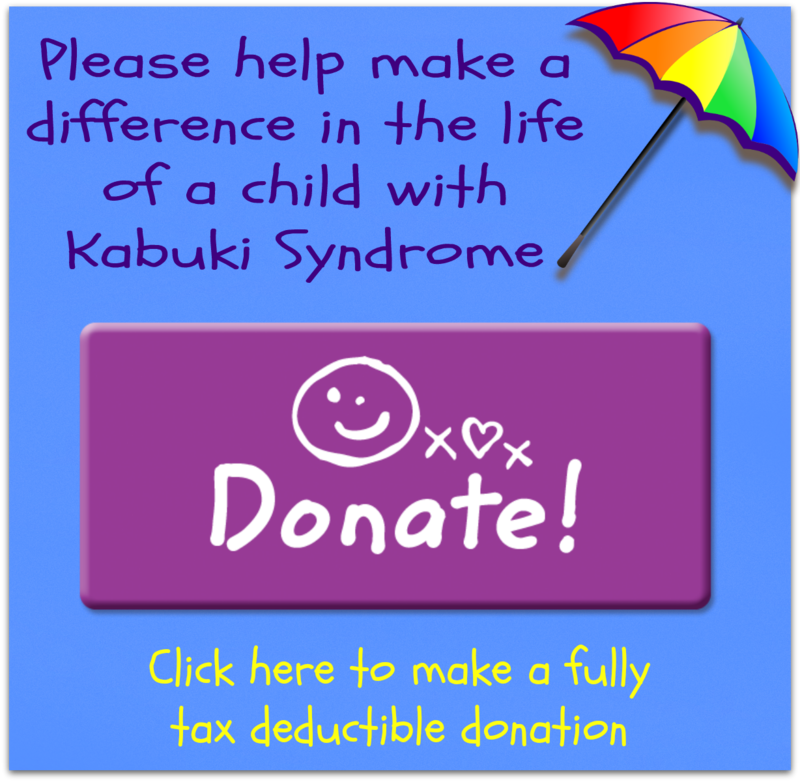 And he answered “ It’s called Kabuki Syndrome”. I had to pull a chair. I couldn’t support my knees anymore. He gave me a brief information about the syndrome. That was by far the most chocking thing that ever happened to me. Worse than the day my mother told me she had cancer. But even more difficult was to answer the phone when Thomas called me on the way to the hospital, 15 minutes later. In a little while he entered the room. He was crying and asking “where is my daughter?” We kept holding her for some minutes. Dr. Meinecke also talked to Thomas. I called my sister and Nina’s godmother in Brasil. And I called my brother in law who came over with his family one our later, with great food and some prints about the syndrome in Portuguese and German. That’s how it happened. I felt very strong that day. I said I was up to the job. She is our lovely baby and nothing is gonna change. We’ll help her to be happy and that’s the only important thing. I even felt relieved. Since she was born I had that strange feeling in my heart. We knew she was late and although we tried to believe everything was fine, we knew there was something wrong, deep inside. My break down came the next day. I was terryfied. I guess you all know what I’m talking about. I was just afraid. I started to imagine she would look weard, and teased by other people. I was afraid she would be “noticed” in the streets. And mostly I was afraid she would suffer a lot, and have all the things on the list of common problems I read about the syndrome. I needed the help of many people that day. My sister called and we talked for a long time. My best friend (Nina’s Godmother) told me some friend knew a girl with Kabuki in Brazil, and she was beautiful and lovely. My sister in law, my mother in law, they all helped a lot. Even Nina’s cousins helped… And the nurses. Poor “sister” Verena saw me crying all weekend. I wrote it down and looked at it everytime I felt bad. And hugged my child, the most beautiful thing in the world, my precious Nina. We love her so much. She brings such a light to our lives. It’s difficult to have the diagnosis while the child is ill. It seemed it would never end. But she surprised us a lot. After that, she was only ill once, and took it very well. We didn’t come back to the hospital yet. She is going twice a week to the phisiotherapy, wich she hates! She is always coughing, but nothing serious. And it’s not easy to make her eat… Everytime we see an specialist we hear the same thing. It’s not perfect, but it’s working well. Her heart, her palate. We feel lucky. Sometimes she does amazing things that we wouldn’t expect. When she completed 6 months she suddenly turned on the bed. Just like that. I was not looking, and she turned. Like every other baby is supposed to do, at the age of six months. I was thrilled. I called everyone I could! She has hypotonia and a broken collar bone, but she did what other babies do. We will start an early learning therapy pretty soon. We hope it will help. She still cannot support the head very well and cannot sit yet. But she is very active and tries to do things really hard. She just learned how to put the pacifier into her mouth. She does it all the time. And I get happy everytime I see it. Reading all your stories was very inspiring and scary at the same time. You are all very brave parents and should be proud. Some of you have kept your children’s lives with your own hands. It’s outstanding. There are those days when I get scared again about what is coming. But most of the time I just enjoy my baby. I think we should not hate the Syndrome. I always think of that. Nina would have a different face if she was not Kabuki. How could I live without those eyes? I wouldn’t trade her for anything in the world. Her father feels the same.